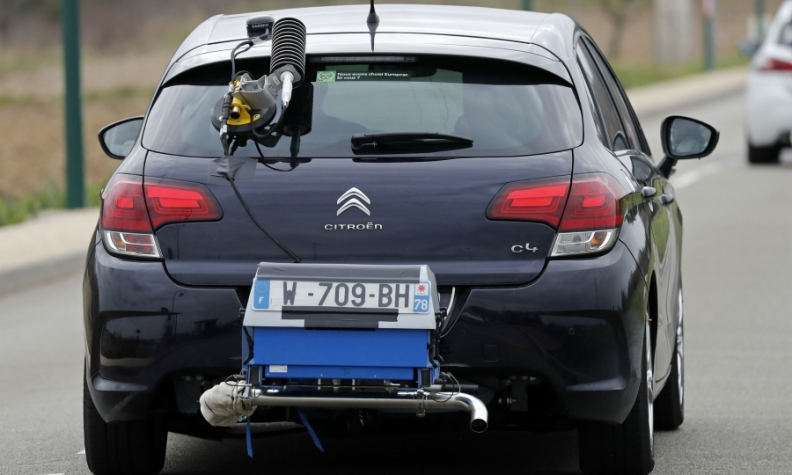 Cars will be tested using a portable system to calculate fuel consumption, CO2 and NOx emissions during real-world driving. The device is pictured on a Citroen C4. FRANKFURT -- The European Union is introducing tougher vehicle emissions tests in a move that could prevent another Volkswagen-style scandal. Two tests to measure emissions before new cars are approved for sale throughout the bloc come into effect Friday. Laboratory tests will now be done under the Worldwide harmonized Light vehicles Test Procedure (WLTP), replacing the New European Driving Cycle (NEDC) tests. The WLTP will introduce testing conditions for measuring harmful pollutant and CO2 emissions and could help stop automakers exploiting loopholes to "game" the tests. An additional new test, known as the real driving emissions (RDE) test, will measure pollutant emissions on the road for the first time. Cars will be driven on public roads over a wide range of conditions using portable measuring equipment. RDE will complement WLTP to ensure that pollutant emission levels measured during the laboratory test are confirmed on the road, said ACEA, the European automakers' lobby group. The auto industry has come under fire after VW admitted to rigging engine software in about 11 million diesel cars worldwide to hide high levels of NOx. The scandal spread when authorities across the world started to investigate emissions in cars from other automakers. VW's cheating came to light when researchers from West Virginia University in the U.S. noticed big discrepancies between official NOx emissions figures for the automaker's diesels when they were tested in laboratories and in real world driving. In 2015 - after the results were investigated by U.S. authorities - VW admitted manipulating engine software so that emissions-reducing equipment as switched off during lab tests. Automakers welcomed the new testing regime, even though it will make their lives harder. They hope the tests will help to placate critics and restore some degree of credibility to the industry by improving the transparency of official test figures. WLTP will introduce "much more realistic" testing conditions for measuring pollutant and CO2 emissions and provide a more accurate basis for measuring a vehicle's fuel consumption and emissions," ACEA said in a statement. "Currently about 95 percent of drivers can’t match the official fuel consumption figure, so it can only be in our interest as well that the levels certified by the test cycle more closely align with what realistically can be achieved on the road," Porsche's research and development chief, Michael Steiner, told Automotive News Europe. The WLTP lab tests will make it harder for automakers to manipulate lab test results. Currently some companies use tricks such as overinflating tires, adjusting or disconnecting brakes to reduce friction, and taping cracks between body panels and windows to reduce air resistance. Sometimes they even remove wing mirrors, according to pressure group Transport & Environment. According to Germany's VDA, the WLTP test procedure is more dynamic since it has many more acceleration and braking cycles than its predecessor. The temperature at which a vehicle is measured and the definition of the correct tire pressure are standardized. Fiat Chrysler Automobiles was accused by the German government of cheating tests. Germany's probe found that in some Fiat vehicles the emissions treatment system was throttled back after 22 minutes. The normal duration of regulatory tests is about 20 minutes. Under the new test, the vehicle will be tested over 30 minutes. WLTP tests cover a wide range of vehicle operating conditions and traffic situations. The test will also be conducted with the help of chassis dynamometers in a controlled environment, since only these stationary rollers can reliably replicate test results. The tests will be phased in, beginning with new vehicle types before eventually being expanded to include all new vehicles sold in the EU. Automakers will continue to provide fuel consumption and CO2 emission figures under NEDC alongside those determined by the WLTC so consumers have a comparison basis, but certification will only be possible with the new cycle. "It's a bit like when the single currency was first introduced. Prices were then given in euros, but there was still the old one in Deutschmark, francs or pesetas," a Volkswagen manager explained. The outgoing NEDC cycle will continue to be the basis for the 2021 fleet emission target of 95 grams of CO2 per kilometer so as not to artificially increase the burden through a change in the rules. Somewhat confusingly the plan is to derive the NEDC equivalent emission figure from a WLTC test result. The EU is also the first global region to adopt tests under which cars can only be approved for sale if they meet emission limits on the road in addition to the rolling test bench. This will in particular affect diesels, where NOx emissions to date remain on average around seven times higher than the legal limit on rolling test bench. Automakers often have used the risk of soot accumulating to justify switching off NOx emission after-treatment systems to boost fuel efficiency and lower CO2 emissions at the cost of higher pollutants.. Under RDE, diesels will initially be allowed to emit a maximum of 168 mg of NOx per km in accordance with a conformity factor 2.1 times the legal Euro 6 test bench limit. As RDE is phased in gradually over time, this conformity factor for new vehicle types will drop to 1.5 times the 80 mg/km lab limit come January 2020. For all new vehicles sold, the introduction of these limits is scheduled for September 2019 and January 2021, respectively. Although RDE will impact on diesels, it also includes as part of the so-called third package a limit on fine particulate matter that will essentially require all direct-injection gasoline engines to include a filter just as their diesel counterparts have had for years now. This goes into effect for new type vehicles in September and will be rolled out to the entire new car fleet in September 2018. Automakers are worried about the effect from the introduction of the WLTC since some EU member states have not adjusted their tax scheme to the more rigorous test. This threatens to put a new vehicle type into a higher tax bracket than a similarly powered car already in the market. Currently 19 EU member states tax cars according to their CO2 values as determined by the laboratory test. "National governments need to act to ensure that CO2-based taxation will be fair, since WLTP will result in a higher CO2 value for the same vehicle compared to the NEDC," ACEA said. "This could increase the financial cost to consumers." German automakers have complained that the Berlin goverment has decided not to adjust its taxation to reflect the more stringent test regime.